Two of my favourite summer food memories are homemade mango ice creams and biting into big slices of watermelons! I grew up in a joint family and we were 8 kids altogether. During summer vacations, we used to create quite a lot of mess at home. With watermelons we had a pretty messy contest of who can throw the seeds farthest! By the end of it, the whole terrace had watermelon seeds all over. 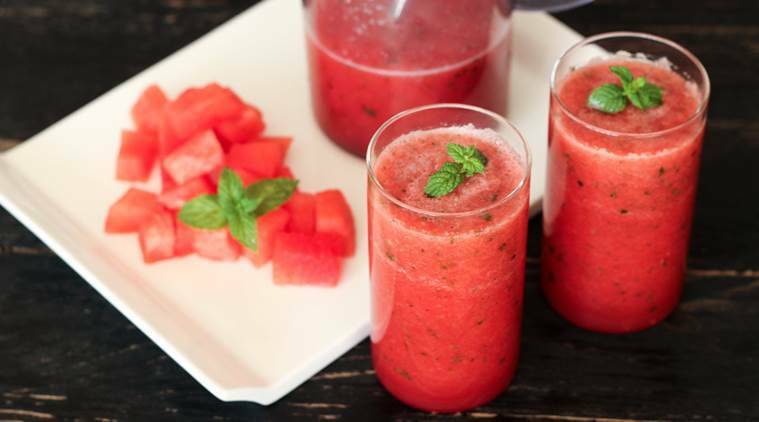 While it is sweet and delicious to bite into a juicy watermelon slice, here are three interesting and healthy recipes you can add to the watermelon party this summer! You can have watermelon for breakfast as a fresh mint and melon cooler, or during meal as watermelon and feta salad, or for dessert as a watermelon sorbet. Watermelon being 90 per cent water, is great for keeping your body hydrated during summer time and since it is mostly water, it is also the perfect fruit to snack on as much as you want and not worry about any weight gain! I hope you enjoy these delicious recipes throughout the summer. This juice is refreshing and perfect to kick start your day! * Remove the seeds from the watermelon cubes. The thin white seeds are okay but remove the black ones. * Add all ingredients into a blender and blend until smooth. If you want, you can strain the juice for a thinner and clearer consistency but I like the fibre and it is super good for your digestive system too, so I would suggest not straining the juice. * Garnish with fresh mint leaves and serve cold. Note: If you are making it as welcome drink for a party, fill half the glass with watermelon and mint juice and remaining half with lemon-soda water for a twist. You can also spike it! This cool and refreshing salad is perfect for a light summer lunch or as a starter to bigger meal. Feta is a middle Eastern cheese with slightly salty taste and smooth texture, it goes very nicely with the sweet and crunchy watermelons! * Place the watermelon cubes in a big mixing bowl. * Sprinkle over black salt. * Add fresh mint, rocket leaves, and crumble feta on top. Gently mix. * Keep in fridge for about 30 mins before serving. Note: If you don’t have feta cheese, a simple rocket leaf and watermelon salad also tastes great! * Remove the seeds from the watermelon cubes and add in the blender along with sugar. Blend until smooth. * Pour into a box and freeze for 2 hours. * Remove from freezer and again blend it in a mixer. * Return to freezer and freeze for 6-8 hours. * To serve, scrape the sorbet with a spoon and serve immediately. Note: The sorbet will melt very quickly as it is largely only water so take it out only at the time of serving.